Former New Vision photojournalist Peter Busomoke. File photo. 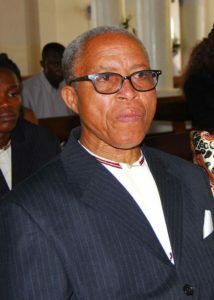 New Vision veteran photojournalist Peter Busomoke has died aged 67. During his photojournalism career that spanned close to forty years, Busomoke is believed to have traversed the continent, taking some of the most captivating photographs. One such photograph shows South Sudan icon John Garang board the ill-fated plane that crushed in Imatong hills, killing him and his entire crew. It was the last photograph taken of Garang when he was alive. In the photograph, Garang was seen ascending on the steps on the helicopter before the tragic accident. Busomoke died early Saturday morning at Kiruddu hospital, Makindye from lung and liver complications. He has been frail for the last couple of years. During his illustrious career, Busomoke took photos in some of the most dangerous places in the Great Lakes region, including DR Congo where he covered the Kisangani clashes between Ugandan and Rwandan soldiers. Busomoke has worked for various leading media organizations in the region. At the time of his death, he was still working as a photographer with The New Vision.